Welsh Rugby Union chairman Gareth Davies says some players will always choose to play abroad despite the new national dual contracts. But Davies believes the new deals will allow the four regional teams to retain far more of their Wales stars. Twelve players have so far been offered dual contracts, but Davies expects this to be expanded "in the near future". "The odd star player will always go to England, will always go to France for different reasons," Davies said. "Some for money maybe, some for cultural experiences which in some ways you can always support. "But there's an opportunity now to retain a base of players, looking for next year's World Cup and the next World Cup in 2019." Wales back-row Dan Lydiate is expected to join fellow flanker Sam Warburton on a dual contract, while Newport Gwent Dragons coach Lyn Jones said contracts are on offer to Taulupe Faletau, Hallam Amos and Tyler Morgan. "I'd like to think that with the start now of a dozen or so national dual contracts, probably with the opportunity of half-a-dozen more maybe in the near future, then that gives us the backbone of future generations," Davies told the BBC's The Wales Report programme. "That's why the regions were very keen to retain players in Wales as opposed to attract players back. "There's been speculation of Dan Lydiate coming back, so it's a mix at the moment but I think it is a strong statement. I hope the players buy into it." 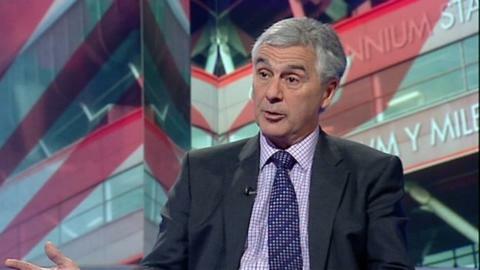 Former Newport Gwent Dragons chief executive Davies became WRU chairman in October 2014 after former incumbent David Pickering failed to win re-election. Davies' elevation to chairman followed a long and bitter dispute between the WRU and the four Welsh regions, Dragons, Cardiff Blues, Ospreys and Scarlets. The two sides signed a new £60m deal in August 2014 that settled funding arguments and aimed to keep star players in Wales. "The regions realise they've got a chance of sustainability, they have a platform from which to build," Davies said. "When I was working at the Dragons - and I'm sure the other regions would agree - there's still a lot of weaknesses you could argue. "Are the regions marketing themselves in the proper way? Are the regions working closely with the WRU to maximise the benefits of working with the national team? "I think perhaps the answer to that is big question-marks, probably not. "That's why in my first few weeks I've been calling for a united front, because we can't carry on being fractious."